A Beautiful Detached Villa with three double bedrooms, large garden, private pool. Set in a peaceful, rural location offering a high level of privacy. 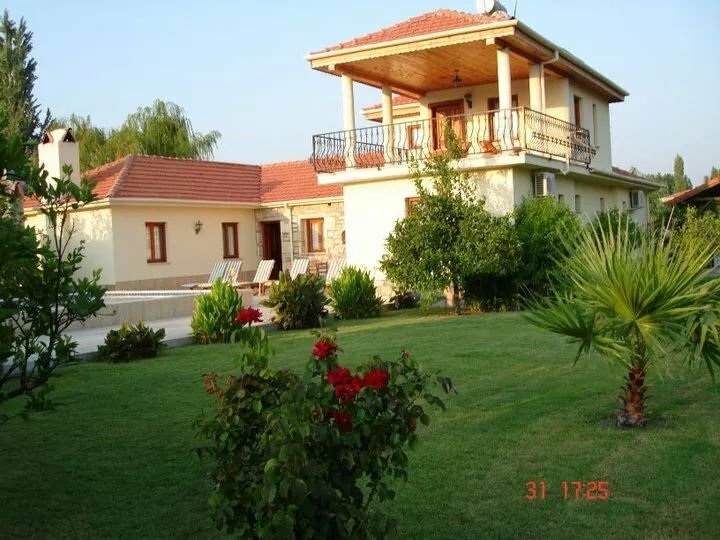 Villa Ikinci Bahar is a stunning villa situated in Marmarli. Marmarli is a hamlet which lies 2km east of Dalyan. This is a quiet tranquil area and the villa has magnificent views of the countryside and mountains beyond. The villa has three luxuriously fitted and furnished bedrooms on the ground floor. Two double rooms, one with an en-suite and the other with a separate shower room and a twin room also with a separate shower room. All bedrooms have full air conditioning. The kitchen is fully equipped with fridge/freezer, oven/hob, dishwasher, microwave, kettle, toaster, coffee machine and water cooler/dispenser. The lounge area has luxurious leather sofas with comfortable cushions, a feature working stone fireplace, Smart 3D TV, DVD, Music System and air conditioning. There is also dining facilities for six people. The villa has full Internet connection and telephone for incoming calls. Stairs from the large hallway lead up to a quiet room that has a sofabed, an ideal place for a quiet afternoon nap or maybe just to read. This room could also be used as a fourth bedroom providing accommodation for a further two guests as it also has a toilet and washing facilities. From this room there is access to the upstairs balcony that is furnished with beautiful cane furniture for you to relax and enjoy those wonderful mountain views. Outside the villa is built around a courtyard, giving guests total privacy. There are sunloungers wıth cushions and umbrellas for those who prefer shade. The pool is slightly raised and is very secluded. There is a traditional wooden kosk with sumptuous cushions for evening relaxation and a barbecue and pre-pool shower. The garden is landscaped with trees and shrubs. Internet and telephone for incoming calls. Welcome Packs can be arranged and paid for locally. The unique layout of this beautiful villa gives privacy around the patio and pool area and the mountain views are stunning. The pool is 30 square metres in total and is 1.3m at shallow end stepped down to 1.6m at deeper end. The villa has three bedrooms but can accomodate up to eight people using the sofa bed in the upstairs room adjacent to the roof terrace. There is also a toilet and washbasin in this area for the convenience of guests. We have a varied selection of CD's and DVD's for use by guests. The very famous Turtle Beach is approx 15mins by car and 30mins by dolmus or boat from Dalyan.